I have decided to give a few awards this year to highlight those whose work I find stimulating, eye-opening or essential. Feel free to submit your own nominations in the comments. 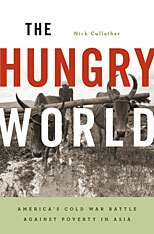 The Hungry World, by Nick Cullather, was actually published in 2010, but I did not get to it until this year. The book tells the complex story of the inter-relationship of US Cold War politics and the so-called Green Revolution in Asia. It is not an easy book, and it does not have a simple linear narrative. But it is chock full of original historical research, skews multiple myths and provides an insightful look into how technology, politics and culture intersect at the level of global geo-politics. This book has provoked a lot of thinking on my part this year and has influenced my ongoing research trajectory more than any other. We seek a global audience, but our perspective is Australian. Like the Institute itself, The Interpreter has a strong commitment to analytic integrity. Its editorial stance is independent, non-partisan and directed towards informing and deepening the debate about international policy. They succeed admirably in that ambition, making it a daily stop for me. Actually, I don't even know if VoxEu qualifies as a blog -- they call themselves a "policy portal." Whatever it is, VoxEu has, word for word, one of the best one-stop-shops for high quality and provocative policy analysis anywhere on the web.
. . . promote research-based policy analysis and commentary by leading scholars. The intended audience is economists in governments, international organisations, academia and the private sector as well as journalists specializing in economics, finance and business. Every day I find something new, interesting, challenging or unexpected on their homepage, and it never seems to stop, making it another daily read for me. In fact, in just a few minutes I'll be blogging on a fascinating piece I found there just today. I don't know where he gets the energy or the patience, but Andy Revkin's Dot Earth at the New York Times is an institution in media coverage and commentary on the environment and climate change in particular. Over the years, Revkin has taken heat from just about everyone in the climate debate -- me included;-) -- and he has continued to produce daily (and sometimes hourly) content that can be found nowhere else. Revkin's email chains are legendary and are a key tool to get experts talking among one another, which serves his blogging but also the community itself. Revkin has moved slowly but steadily toward asserting his own voice, which I hope continues. For me, 2012 will see a dramatic turn away from climate as I devote most of my time to a new book, but DotEarth will be one key way that I'll keep touch.